DOYLESTOWN (PA) – The Delaware Valley University football can win the outright Middle Atlantic Conference (MAC) championship and an automatic berth to the NCAA Division III playoffs on Saturday, November 11 when the undefeated and fifth-ranked Aggies host archrival Widener University. Kickoff at Robert A. Lipinski Field at James Work Memorial Stadium is scheduled for 1 p.m.
At 9-0 overall and 8-0 in the MAC, DelVal has already clinched a share of the conference crown, its seventh since 2004. The Aggies are fifth in the American Football Coaches Association (AFCA) Division III poll while holding the number seventh spot in the D3football.com poll. More importantly, they were ranked first in the East Region in the first NCAA Regional Rankings that were released last week (this week’s rankings have yet to be announced). Widener is right behind in the league standings with a 7-1 mark (7-2 overall) A win by the Pride would make them co-champions with the Aggies (the conference recognizes multiple champions) and also give them the MAC’s automatic berth to the NCAAs (due to the head-to-head win in the tiebreaker). That would put DelVal into a group of teams looking for one of the five at-large berths to the 32-team, national tournament. Also on the line is the Keystone Cup which is handed out annually to the winning team in the series. Widener holds a 28-11 advantage in the series, but the Aggies have won 10 of the last 14 meetings (including triumphs in 2015 and 2016) since they turned their program’s fortunes around in 2003). 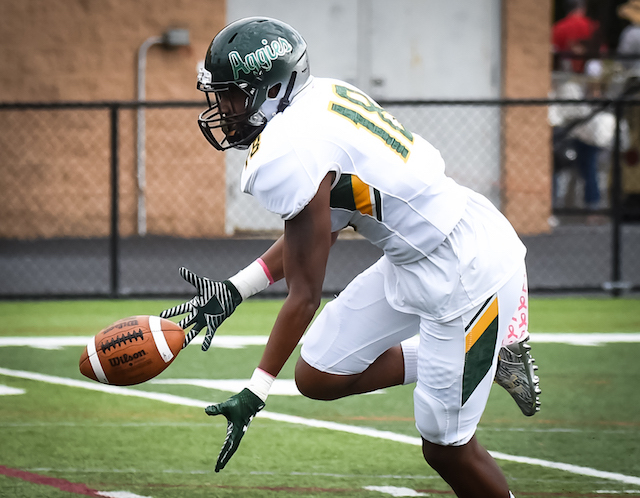 DelVal, which has never trailed in a game all season, is coming off a 51-7 rout at Misericordia University last Saturday. The team dominated all facets of the game, including the offense which racked up its highest scoring output and yardage total (556) of the season. Those numbers helped up the unit’s season averages 39.4 points and 431.6 yards (243.1 avg rushing, 188.4 avg passing) per contest. Senior tailback Devauntay Ellis (Ewing, NJ/Ewing) is the reigning MAC Offensive Player of the Week and also earned a spot on the D3football.com Team of the Week after he netted 231 yards and five touchdowns on just 19 carries against Misericordia. He saw just 39 minutes of action in the game, yet racked up the second-highest touchdown total and the fifth-highest rushing yardage total in program history. For the season, Ellis is the conference’s leading rusher with 1,066 yards and 15 touchdowns on 160 touches. He has 378 yards and eight scores in his last five quarters of action. Junior quarterback Dashawn Darden (Norristown, PA/Cardinal O’Hara) has completed 121 of 214 passes for 1,567 yards, 19 touchdowns and just four interceptions. He has also rushed for 442 yards and three scores. Junior wideout Marquis Ellis (Owings Mills, MD/Franklin) heads a balanced group of receivers as he has hauled in 24 passes for 326 yards and six touchdowns. The Aggie defense continues to be ranked among the best in Division III, including scoring where they are third with just 8.6 points allowed pe game. They are also eighth in total defense (226.4 yards per game) and 11th in rushing (74.9 yards per game). Senior linebacker Nicholas DiGati (Townsend, DE/Middletown) leads the team in tackles with 65 (29 solo). He also has one forced fumble to his credit. Senior safety and preseason All-American Shawn Miller (Laurel, DE/Laurel) has 45 tackles to go along with three interceptions and a blocked punt. Senior linebacker Nick Wright (Hatfield, PA/North Penn) has racked up 40 tackles, three interceptions and three sacks. He also has 20 points thanks to a fumble return for a touchdown, an interception return for a score and a safety on defense and a blocked punt return for a touchdown on special teams. The starting front line of sophomore Vincent DiLeo (Philadelphia, PA/Bishop McDevitt) and senior Marc Isaac (Warminster, PA/William Tennent) and junior Christian Snowden (Williamstown, NJ/Saint Joseph Hammonton) have combined for 83 tackles and 8.5 sacks this year. After starting the year off 2-2, the Pride have won five straight including last Saturday’s 27-6 home triumph over King’s College. The Widener defense notched 11 sacks, five interceptions and two scores in the victory. In fact, that unit leads all of Division III with eight defensive scores. The Pride are also fifth in the country in sacks with 36 and 14th in scoring, allowing just 11.9 points per contest. Junior tackle Vince Char is the reigning MAC Defensive Player of the Week as he had 13 tackles and six sacks against King’s. He has 69 tackles on the year and is ranked third in Division III with 12.5 sacks. Senior end Casey Kerschner is right behind as his 12 sacks ranks fifth nationally. He is also the team leader in tackles with 82. Junior defensive back Jordan Powell was named to the D3football.com Team of the Week after scoring two times against King’s. He has 48 tackles, six interceptions for 176 yards and three touchdowns, and three fumble recoveries for 99 yards and two scores. On the offensive side of the ball, Widener is averaging 25.1 points and 348.9 yards (112.9 avg rushing, 236.0 avg passing). Sophomore quarterback Sean McGaughey has thrown for 1,300 yards and seven touchdowns in seven games. Senior Montrell Hicks-Taylor is the leading wideout with 39 catches for 827 yards and seven scores. The ground attack features starter Chris Randle and the sophomore has 393 yards and three touchdowns on 87 carries.